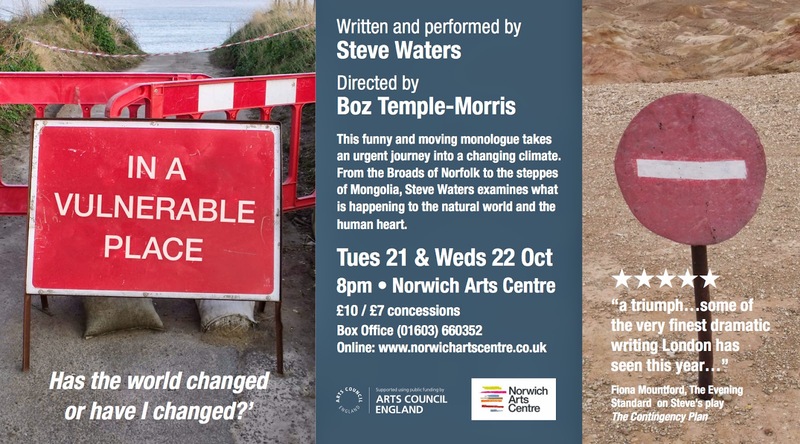 Jonathan Woolley - anthropologist currently working in the Broads. Cambridge are hosting me for this talk, early next month - please do come and join me as I question the myths of "progress" and [economic] "growth"
"This referendum has demonstrated that when it comes to deciding the future of our country, people want to be asked. It would be a terrible waste if we do not build on that passion by ensuring everyone in the UK, and not just Scots, have a say in where power lies. "Now is not the time for top-down commands on our constitution, issued by political leaders in the immediate, frenzied aftermath of this momentous vote. The future shape of the country is too important to be rushed through Parliament without consulting the people. "We need a UK-wide, citizen-led Constitutional Convention to determine where power lies in the future. We can draw on international examples to create a process which does justice to people's passion for change. "Such a process needs clarity of purpose, and certainty about how its conclusions will be taken forward. It needs the full support of all the political parties, but it must also retain its independence from them. "Above all, a UK Constitutional Convention must capitalise on the enormous amounts of interest and passion sparked in Scotland by the independence referendum, and bring that passion for determining our political future to the rest of the United Kingdom." At 7pm on Mon. 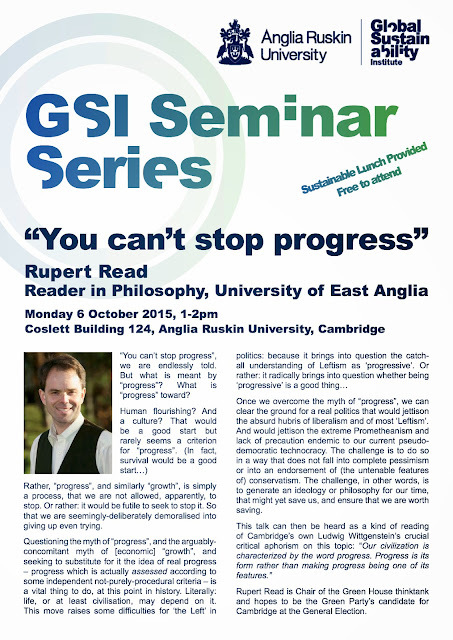 15th September, Cambridge Green Party will have a 'hustings' meeting to grill its potential candidate for the Parliamentary seat, Dr. Rupert Read, who is a Reader in Philosophy at the University of East Anglia. Dr. Read is well-known to many Cambridge voters and to the media as the recent lead-candidate for the Green Party in the European Elections: Read came within 1% of being elected MEP. Now he hopes to stand in Cambridge, for MP. Cambridge was the Green Party's 3rd strongest result in the whole UK, after only Brighton Pavillion (where Caroline Lucas was elected as the Greens' first MP) and Norwich South, at the 2010 General Election. This May, the Green Party scored nearly 20% in both the European Elections and the Local Elections. And according to the Green Party's own national geodemographic database, Cambridge has the strongest potential of any seat in the entire UK to become a longterm Green stronghold. Ellisif Wasmuth, Returning officer of Cambridge Green Party, said: "In the Green Party, being the only candidate at a selection does not guarantee selection, there is always an option for members to vote for 'None of the above'. As a party with a strong commitment to local democracy it is important for us to create fora like this where political discussion can take place, and I anticipate a lively hustings. We are very excited to have Rupert Read put himself forward for Cambridge, and look forward to having the chance to question him at this hustings meeting." Rupert Read, who is also national Transport Spokesperson for the Green Party, said: "I anticipate that we will be discussing transport as one of the key topics of the campaign, at this hustings meeting. The Green Party is of course THE Party to back if you are concerned about traffic congestion and air pollution, if you want to take the railways back into public ownership, if you back much better facilities for cyclists and safer streets for pedestrians, and if you care about resisting damaging new road-schemes. I am looking forward immensely to discussing these and other matters of great importance to Cambridge with the Green Party membership on Monday evening." Dr. Read continued, "Cambridge is one of the Green Party's best prospects in the entire country, at the General Election. Voters have lost faith in the old parties and in the vagaries of tactical voting; that's why the Green Party has been experiencing a surge in the polls. Cambridge's voters have the chance to do something extraordinary, next May." 1. 2. 3. Rupert's Read: September 2014 4. 12. 15. 18. 19.